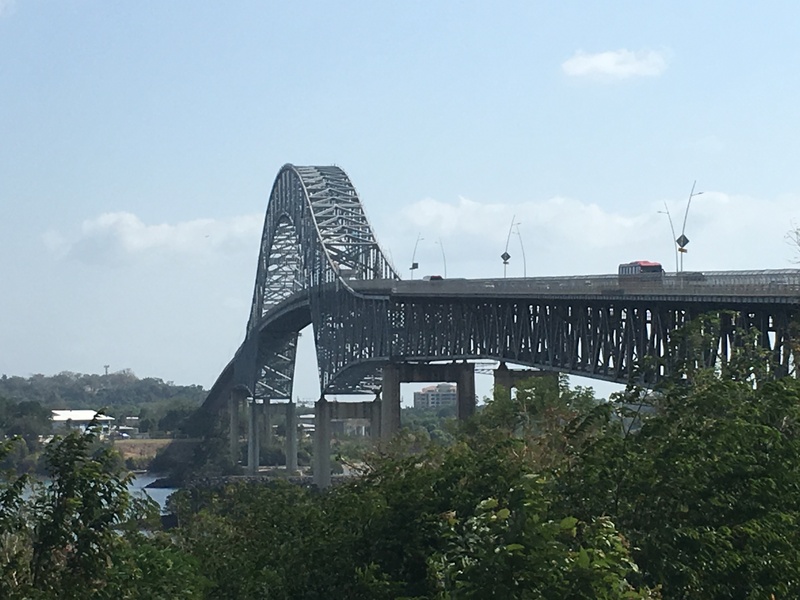 The 30,000 km Panamerican highway that we have been following stops dead at Yaviza, Panama. It begins again at Turbo, Colombia, leaving a roadless gap for 100 kilometres. Known as the Darién Gap, this land is home to three indigenous tribes, the Kuna, the Emberà, and the Wounaan. It also hides drug smugglers, illegal migrants on their way north, and enough paramilitary rebels to leave you shaking in your boots. There have been plans to continue the road but all efforts have failed. A few travellers do manage to get through using jungle trails, wooden river lanchas, and even a short hop on an 8 seater plane. It was tempting to think about the adventure of finding your way through swamp and mountainous rainforest. But I read an account of a couple who recently made the journey. He was left almost paralyzed for days after a motor boat ride on the ocean with a crazed driver. During the ride they were constantly flung airborne, followed by many a spine whacking against the wooden seats. He had to receive injections at a nasty jungle nursing station just to be able to stand up. With sanity taking the upper hand, we arranged for Vanna to have a 3-Day cruise by cargo ship. And we purchased plane tickets for the 45 minute flight to Cartagena. 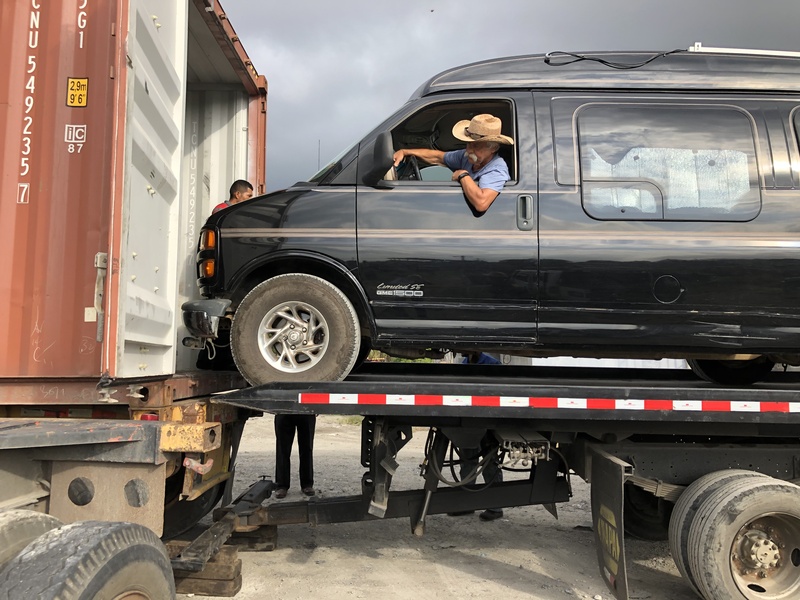 One of the requirements of shipping the van was to complete a police inspection in Panama City. Fortunately or not, our timing for visiting the city coincided with the arrival of Pope Francis, for the World Youth celebrations. Hearing that in his honor, they might close government offices on Friday, we changed plans and made a dash into the city very early Thursday morning. It was dark when we left for the 1.5 hour drive, hoping to arrive at the inspection site by 7 AM. Just as the daylight ascended we found ourselves crossing a long bridge spanning a sea of water. Halfway across it, we woke up. The entire inspection process took place within one day, but in two parts, and we had to drive to 3 different offices. We had read that lineups could be long. But on this day, there were only two others, Enrique, a Panamanian who needed this inspection in order to drive his car to Costa Rica, and Paddy, an Australian lad on a motorcycle. They were friendly and talkative. In true Panamanian fashion, we were all processed at once. This means that at each stage we all stood around with our papers ready, or filled out yet another form, while the officers scrutinized our documents, and asked questions randomly. 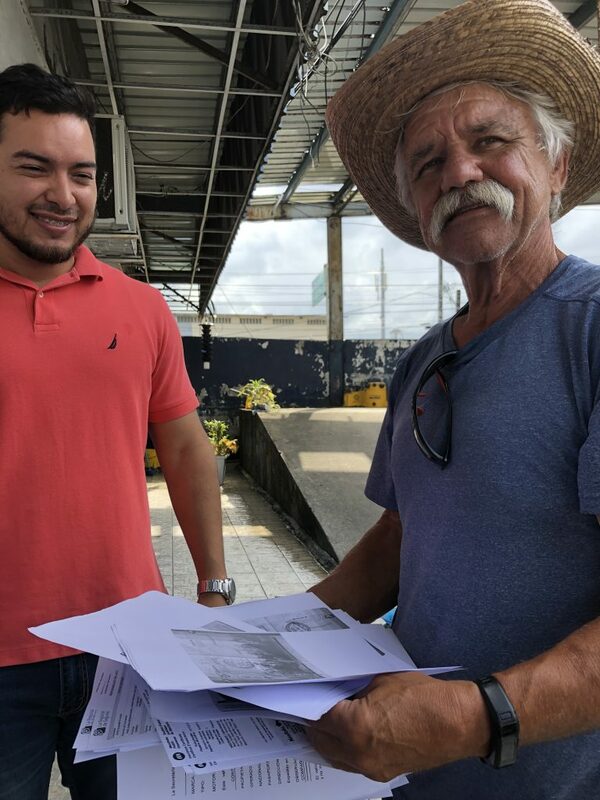 Enrique graciously offered us explanations in Spanish, which were then interpreted to us by Paddy, who had completed two months of spanish classes during a home stay in Guatemala. At one point, the officer decided that our flimsy Manitoba vehicle registration paper was not an original. Yikes! No original means no approval. Paddy stepped in and quite aggressively argued with the officer, who eventually backed down. So with the assistance and camaraderie of strangers, the day went quickly and we had our approval by mid afternoon. 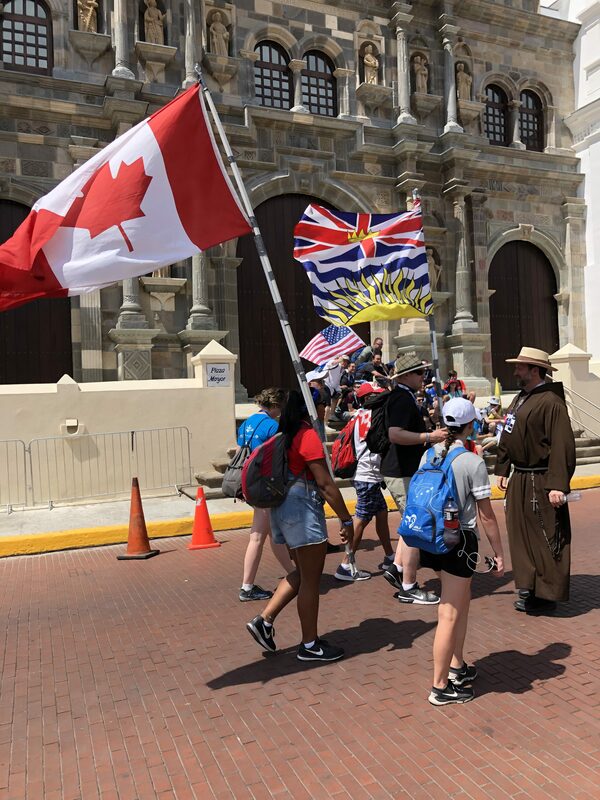 Panama city was a buzz with the Pope’s visit and the streets were full of young pilgrims. They travelled everywhere in groups of 10 or 20, carrying their country flag, singing, or chanting and literally filling every tourist area that we visited. Their presence added an infectious enthusiasm that enlivened the traffic clogged streets, as we walked through different areas of the city. Security was intense with various roads blocked for El Papa convoys, and there were pods of military or police on every corner. An advantage for us was that we felt quite safe going anywhere. 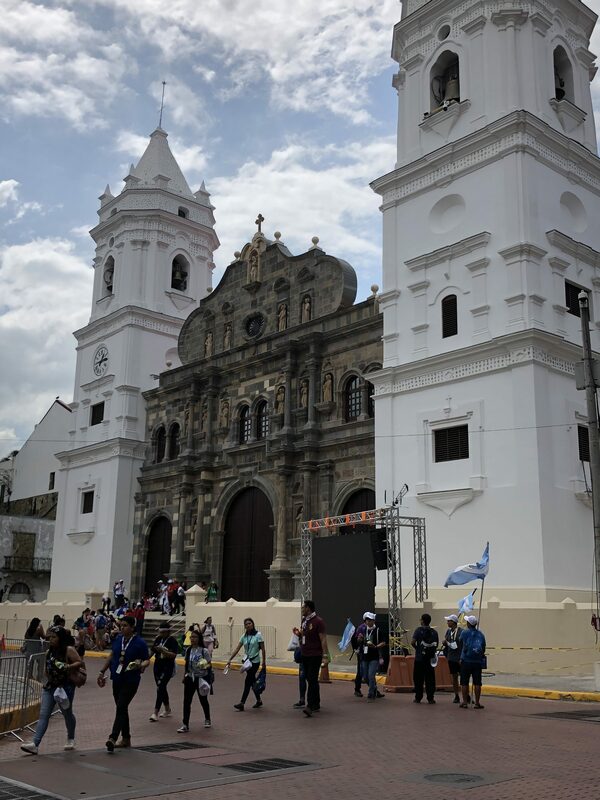 Cathedral of Santa Maria La Antigua in Panama City’s Historic Center, where Pope Francis performed a mass. There was a Friday evening ceremony held quite near to our hotel but we did not go, thinking that we would not be allowed in anyway. So we watched it on TV. Each country stepped up to take a part, kind of like the olympics, ending with a speech by Pope Francis. Not sure what he said though, as it was all in Spanish. 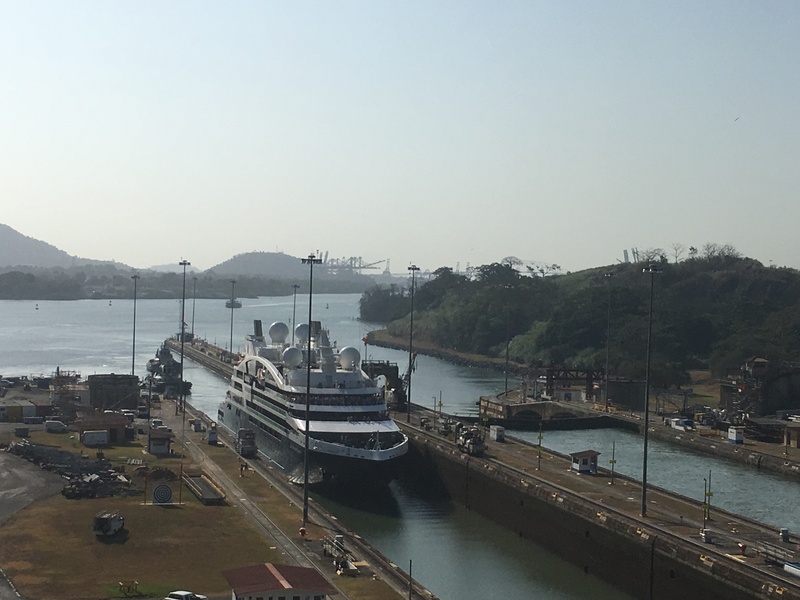 The highlight of Panama City was our visit to the Miraflores Locks. The museum there has excellent displays on the history, the workers and the design. But when we went out on deck, we were transfixed. A small cruise ship was just about to enter the canal. 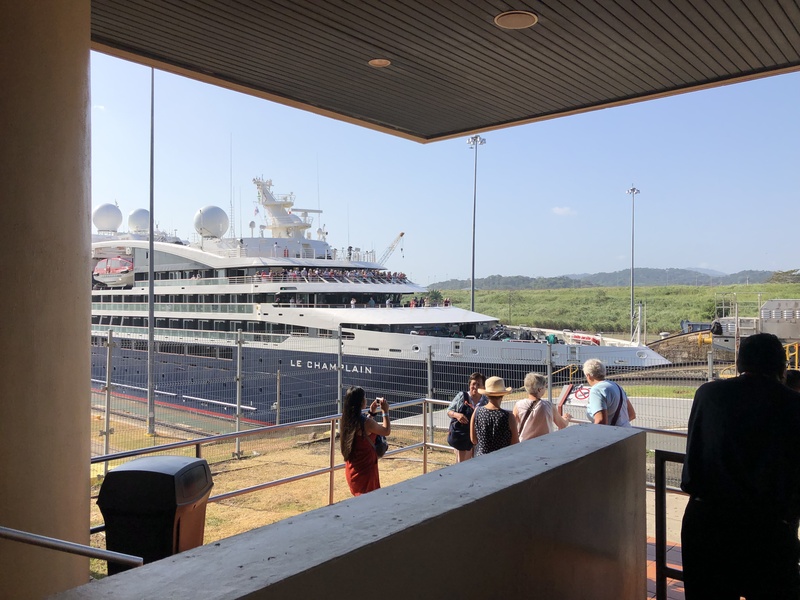 We watched as the water changed levels, the gates opened, and the ship moved forward into the lock. The passengers were all standing on deck, and we were close enough to wave and clap. This process has been explained to me many times but I had to see it to finally understand it. The design is miraculous and the work that went into the construction is unbelievable. It is really incredible. 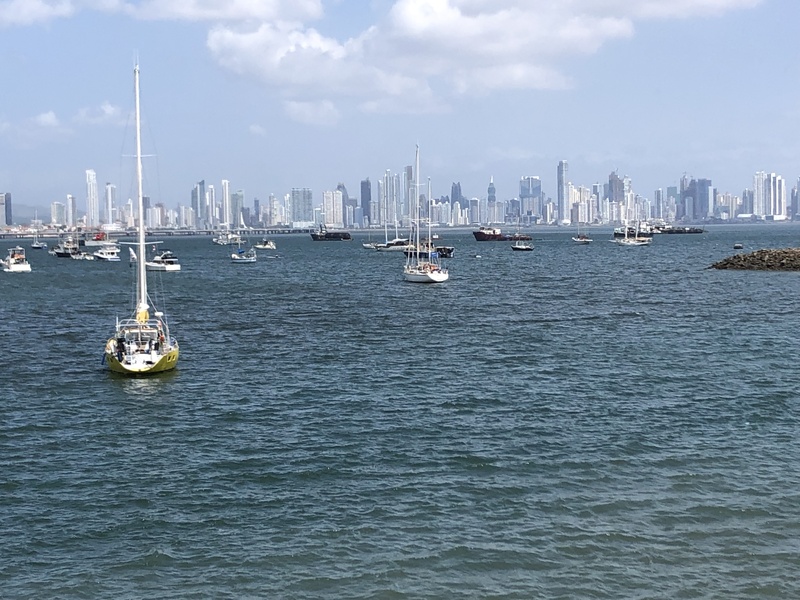 After two days of city, we headed for the Caribbean side of Panama, where La Vanna would depart from the port at Colon. This happens to also be the other end of the canal. 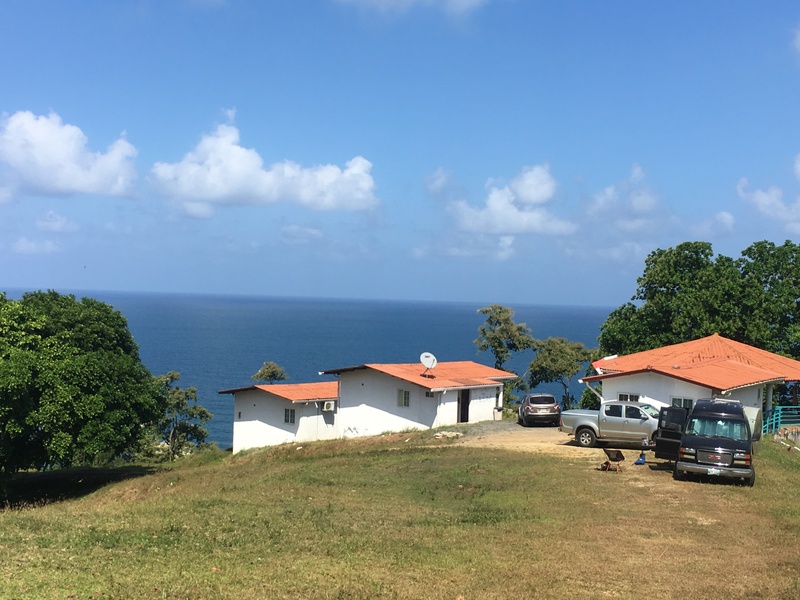 We camped at Rancho Juancho, a cabanas and campground on a high knoll overlooking the ocean. The resort owners, Eddy and Veronica, came here from Venezuela where he practiced law and life was very good. But they left it all and bought this property in Panana where he is not allowed to practice his profession. We also met Oliver and Stanka who were staying in the cabanas and helping out with chores at the resort. 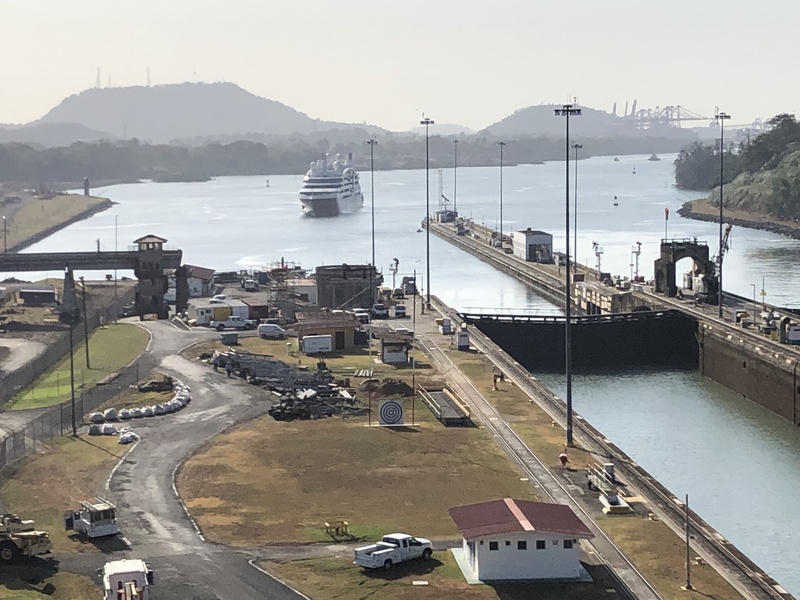 Oliver, an American, was excited about the next leg of his trip, as he had booked himself and his bicycle onto a small sail boat headed for Colombia. At 22 he has already completed a masters in math and hopes to get online programming jobs to fund his travels. Stanka was born in Slovakia, and has lived in many countries including Canada, but now runs a small hotel in England. She is returning home in April for the arrival of her first grandchild. The resort was a piece of paradise. Cooled by the breeze off the water, and shaded from the glaring sun, the terrace was a gathering spot for conversation, hammock hanging, or for watching the ships come and go from the Canal. Sometimes we could see ten or more, their ghostly shape hugging the thin rim of ocean where it met with the bluewhite haze of sky. Large vultures soared overhead, hummingbirds zoomed by, blue headed parrots screeched as they flew and then disappeared into the foliage of a large tree. Late at night we could hear the cries of sloths who live in the surrounding forest. Their sound is similar to the cry of an eagle, only softer. 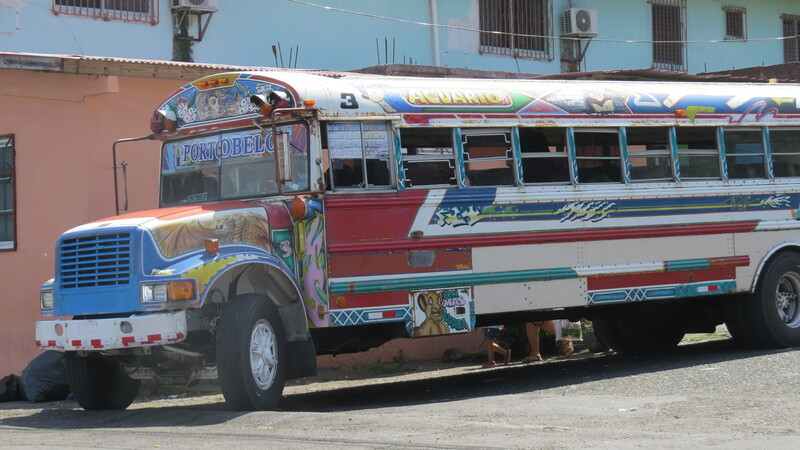 One afternoon we took the local bus, careening down the narrow winding highway to the small village of Portobelo, with brakes screeching at every stop. 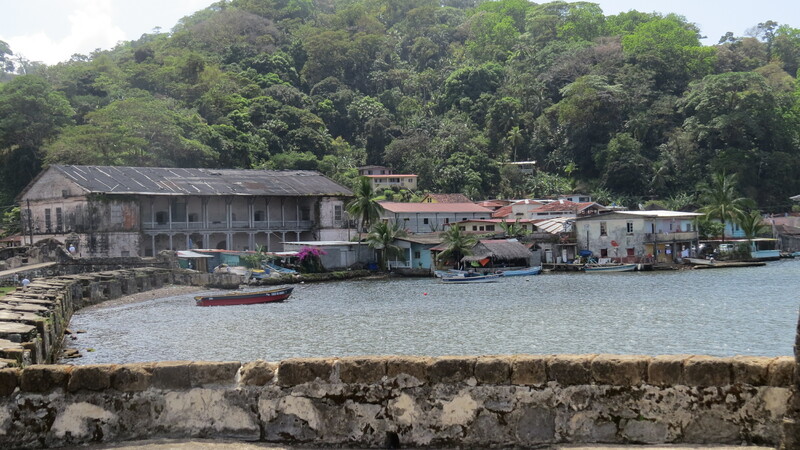 Portobelo was once a Spanish port city, and has an historic Customs house where ships from Spain would load and unload goods in the 1600s. Columbus set foot here as did Sir Francis Drake and the pirate Henry Morgan. The local population are descendants of the Spanish, Chinese and African slaves who came either by force or free will. 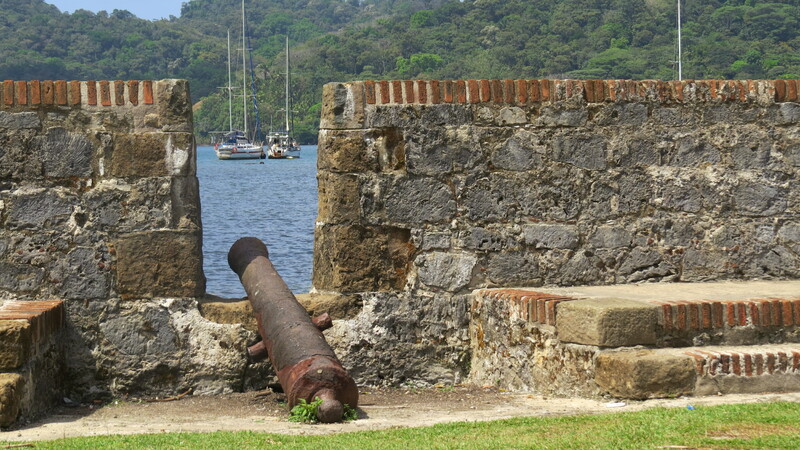 A good bit of the Customs House and old Fort are intact, cannons still in position for the next attack. Busloads of tourists arrive from Panama City for a day trip, so restaurants and artisans were plentiful. But the lack of support for infrastructure was obvious. Both buildings and fort are crumbling into disrepair, and the museum displays are withering with the humidity. We had been in constant contact with our container partners, Peter and Michaela. Michaela had made the arrangements with a UK shipping company, sending many emails and ensuring that all of our documents were correct and properly forwarded. It was a lot of work and we appreciated the effort she made on our behalf. On the scheduled loading day, the four of us met up with Boris in a parking lot in Colon at 8 AM. From there he led us down to the shipyards, and through a maze of containers, boats, cranes and warehouses. There were more than a few chained dogs. And not the friendly type. The loading went like clockwork. Bob and Vanna were lifted up on a tow truck until high enough to drive into the container. With only a few inches of space on both sides of the van, the plan was for Bob to crawl over the bed and exit through the back doors. Then the second van could be loaded. But he was a no show. We began to wonder what he was doing in there. After awhile we realized that he was yelling. The child lock was switched on and he couldn’t get out. The Plan Fly to Cartagena and tour the city while waiting for Vanna to arrive on Feb 3. And then after another set of documents and 2 days of run around we will be on the road in South America. Looking forward to it! 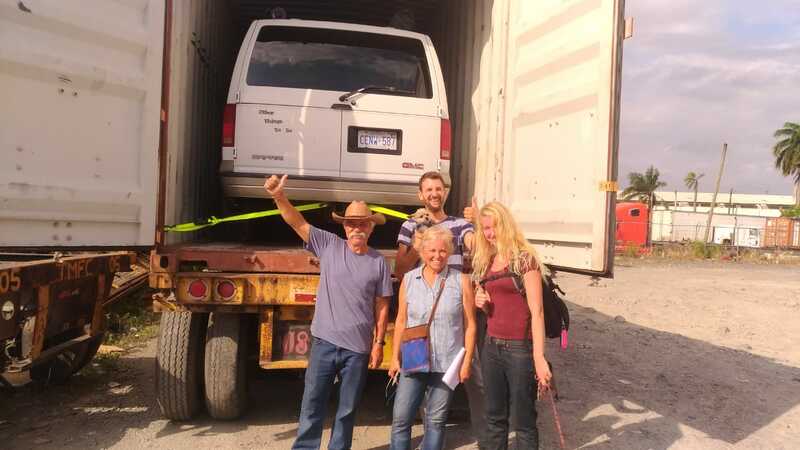 With Peter, Michaela in Colon, Panama, after successfully loading our vans for shipping. 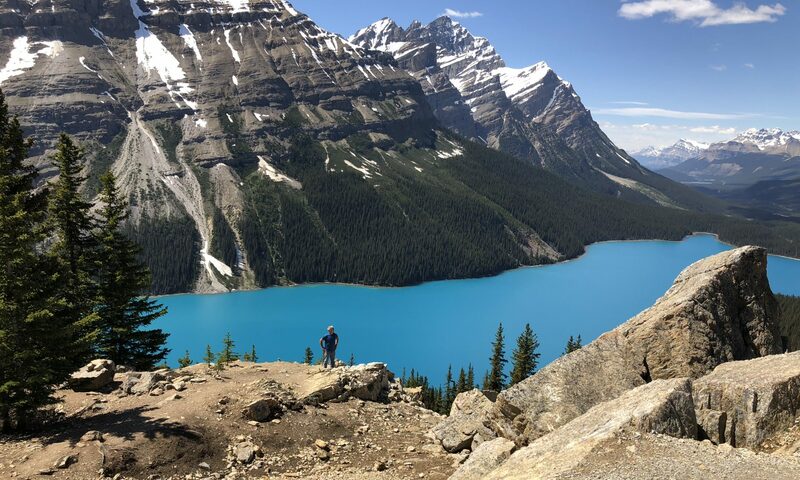 What a great blog of your adventures, Joyce! Greg saw Sally on the loop today and she gave him your website. We are looking forward to our two weeks in San Pancho from the 15th. Safe travels! Have a great trip you guys!